Chelsea scored another goal at the end of the second half to finish the game with 2 goals and 3 points. While it is a credit for Liverpool for not playing for a draw with 1 point enough to keep the title in their hands, Jose Mourinho’s Chelsea did execute his plan quite well to keep their team in contention. Liverpool were clearly not at their best, and successfully frustrated further by the time-wasting and “double-parked-bus” ultra defensive style masterminded by Mourinho. This type of “negative football” is well known and has served him win games and competitions in the past but if Sunderland managed to beat Chelsea, there is no reason why Liverpool couldn’t have – had they kept their nerve and adapted to the Chelsea tactics. 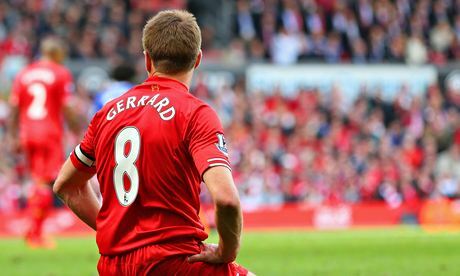 Stevie G tried to make amends by making close to a dozen shots from distance. But it was not Liverpool’s day. And while they remain 2 points clear of Chelsea, Manchester City moved to within 3 points of leaders Liverpool by winning their late game against Crystal Palace by 2 goals which only added to their goal difference. Manchester City still have a game in hand on Liverpool and Chelsea and, with their better goal difference, they have a mathematically better chance of taking the title if all teams manage to win their remaining matches. With its several twists and turns, it is never a given if all three teams will get maximum points from their remaining matches. This is one of the reasons why this season has been one of the most unpredictable in Premier League history. It remains to be seen who will prevail in the end and lift the trophy.